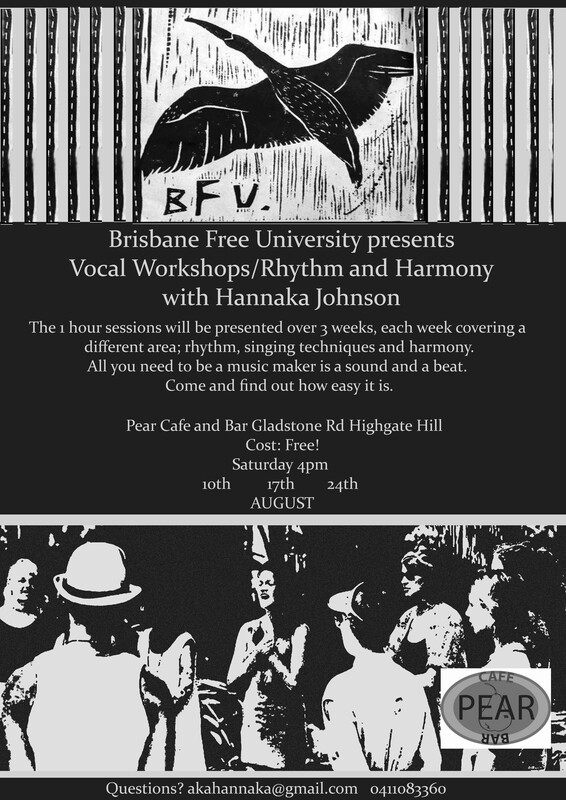 Brisbane Free University is excited to present our first workshop series: a three part musical adventure with local musician Hannaka Johnson. The 1 hour sessions will be presented over 3 weeks, each week covering a different are: rhythm, singing techniques and harmony. When: 4:00 Saturday afternoons for the rest of August: that’s the 10th, 17th and 24th. Where: Please note that this will not be help in our usual car park, but rather in the lovely Pear Cafe and Bar, 43 Gladstone Rd in Highgate Hill. As usual, everything is free!